Not seen: Our solar option will fit between the ridges on a metal roof. is 256 sq ft with lots of natural light you have access to the whole outdoors from the comfort of your home. The outside of this has a simple modern look that can be fine-tuned to your way of life with the choice of color and the optional solar roof system. The interior is fully stocked with plenty of cabinets for storage and all the appliances you will need to move in. Standard features include cook top, fridge, hardwood floors and metal roofing. 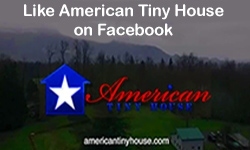 Choose your flooring, wall colors; hardware and other options to make this tiny house your home. This house is designed for full time use or a mountain hideaway with insulation up to R38 from floor to ceiling and energy efficient windows and door the house is very easy to heat and cool.